"Francis Spufford has one of the most original minds in contemporary literature." "Francis Spufford has long been one of my favourite writers of non-fiction; he is now becoming a favourite writer of fiction as well. 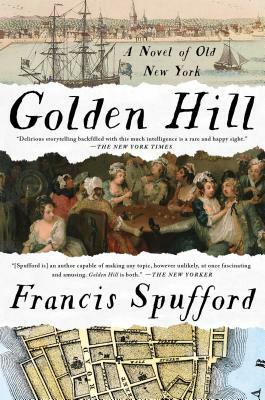 Golden Hill is a meticulously crafted and brilliantly written novel that is both an affectionate homage to the 18th century novel and a taut and thoughtful tale." "I loved this book so much. Golden Hill wears its research with incredible insouciance and grace; a rollicking picaresque, it is threaded through with darkness but has a heart of gold." "The intoxicating effect of Golden Hill is much more than an experiment in form. [Spufford] has created a complete world, employing his archivist skills to the great advantage of his novel ... This is a book born of patience, of knowledge accrued and distilled over decades, a style honed by practice. There are single scenes here more illuminating, more lovingly wrought, than entire books." "Like a newly discovered novel by Henry Fielding with extra material by Martin Scorsese. Why it works so well is largely down to Spufford's superb re-creation of New York ... His writing crackles with energy and glee, and when Smith's secret is finally revealed it is hugely satisfying on every level. For its payoff alone Golden Hill deserves a big shiny star." "Splendidly entertaining and ingenious ... Throughout Golden Hill, Spufford creates vivid, painterly scenes of street and salon life, yet one never feels as though a historical detail has been inserted just because he knew about it. Here is deep research worn refreshingly lightly ... a first-class period entertainment." "Paying tribute to writers such as Fielding, Francis Spufford's creation exudes a zesty, pin-sharp contemporaneity ... colonial New York takes palpable shape in his dazzlingly visual, pacy and cleverly plotted novel." "Golden Hill shows a level of showmanship and skill which seems more like a crowning achievement than a debut . [Spufford] brings his people and situations to life with glancing ease ... They all live and breathe with conviction ... His descriptive powers are amazing ... Spufford's extraordinary visual imagination and brilliant pacing seems to owe more to the movies than anything else."